South Carolina’s GOP electorate is not monolithically conservative, which is why it’s been such a good predictor of the ultimate GOP nominee supporting both moderates such as Bush 41, Dole and McCain, and conservatives such as Reagan and Bush 43. Any pundit who analyzed Newt’s victory in South Carolina as a result of a uniform electorate either doesn’t know the state, or has an agenda to marginalize the conservative message. 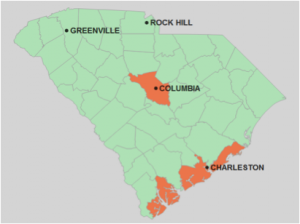 South Carolina has forever been divided between the coastal plains and the Appalachian foothills. This red and blue map shows the 2008 GOP primary: Red counties voted for the more conservative Huckabee; Blue counties voted for the more liberal McCain. Conventional wisdom assumed the 2012 GOP primary vote would remain similarly divided. How else can you explain this electorate sending both a Tea Party leader Jim DeMint, and an establishment moderate Lindsay Graham, to the US Senate at the same time? But look at what happened in the primary Saturday. Newt won in almost every demographic breakdown: married women, married men, single women, single men, the military, evangelicals, the low income, middle income, and upper income, etc. Only the super high income, over $200,000 per year went to Romney. It was a landslide. 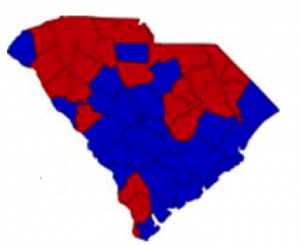 The point to take away is how unifying the victory was given the historical divisions within South Carolina, winning in every demographic and geographic region, except the very edge of the southern coast. Thus Newt’s win is a more stunning victory given this context than the numbers alone suggest. Why did he win so big? It’s simple really: we want a fighter who will stand up for our beliefs. Obama is ruining the country on purpose; he calls it “change.” This is different than saying he’s a good person who means well (McCain) or a nice incompetent who is in over his head (Romney). We don’t believe he’s just a well intentioned incompetent. He has set about to transform the country and we want it stopped and reversed. Who is more electable, who is more likely to beat Obama? We know Obama can’t run on his record, and he has no ideas left that he didn’t implement other than more of the same, plus cap & trade. So he will campaign to destroy his opponent personally, hoping Americans conclude the devil we know is better than the devil we don’t. A great way to beat the negative destructive campaign Obama will wage is with big ideas that are superior. In Florida, Rubio used the “big idea” vision campaign to beat back the Crist approach that called Rubio a crook and hypocrite. Which candidate can offer those big ideas, hold steady against the onslaught from a media supporting Obama, as well as fending off Obama’s direct attacks while defending our beliefs? South Carolinians Saturday declared they believe its Newt.